Do Calf Raises Improve Vertical Jump? Jumping is a component of numerous athletic events. 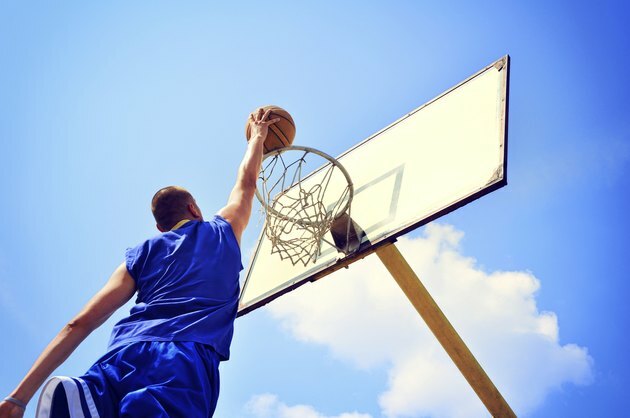 For decades, athletes have tried to improve their ability to jump higher. These efforts have involved wearing funny shoes, lifting weights and jumping rope. Calf raises alone may positively affect jumping ability, however, a multifaceted approach to improving your vertical jump yields better results. Jumping utilizes every muscle in an individual's lower body. The four biggest muscular factors involved in jumping include the strength of the gastrocnemius and soleus or calves, quadriceps, gluteus maximus and the core muscles. When an athlete jumps, each of these four muscle groups form a chain connected to the ground. If any particular link in this chain is weak, the athlete cannot jump very high. Therefore, it is important to strength train each muscle group to locate the weakest link. Calf raises are an important part to increasing vertical jump, however, they are not the miracle cure. Human calf muscles are extremely strong. They carry us around daily. When strength training use enough weight to provide overload. The muscles should be fatigued by the tenth repetition. When calf raises are performed standing with weight on the individual's shoulder, the gastrocnemius produces the majority of the force. According to the "Joint Structure and Function" paper, calf raises performed on a seated calf raise machine cause the gastrocnemius to be at a mechanical disadvantage that leads to the soleus producing the majority of the force. Perform calf raises both standing and seated to target both muscles that comprise the calf. Plyometrics exercise involves repeated rapid stretching and contracting of muscles by jumping and rebounding to increase muscle power. This concept involves specificity of training. Basically, this concept states that if you would like to jump higher, you must train by jumping. The American College of Sports Medicine states that "explosive exercise training appears to increase a wide range of athletic performance variables to a greater extent than traditional heavy weight training." Examples of plyometrics include box jumps, weight and unweighted vertical jumps, jumping rope and frog jumps. The unfortunate truth is that overweight people cannot jump high. The reason is obvious: there is more weight to propel off the ground. Weight loss, particularly body fat, can be a crucial part of gaining the ability to jump high. For more assistance with weight loss, consult a physical therapist, personal trainer, or dietician in your area. Calf raises can improve the ability to jump higher, but they must be combined with other exercises. Strength training must be performed, not only on the calves, but also the quadriceps, gluteus maximus and core. Also, incorporate plyometric training into the workout to specifically train the muscles to jump. Lastly, don't forget to measure the height of the vertical jump before training in order to track progress. "Joint Structure and Function: A Comprehensive Analysis, Fourth Edition"; Levangie, P.; 2005. Do Basketball Shoes Make You Jump Higher?